We all know that we need drywall on the ceiling to make the room look complete. But did you know that the drywall is also a critical part of your air & thermal barrier in your home and that’s just a small part in a more complex system. Thank of your house like a car. If one part of the complex system starts to fail, other parts of the system have to work harder. This can make the car less efficient and can cause other components to wear out faster. Your house works the same way. 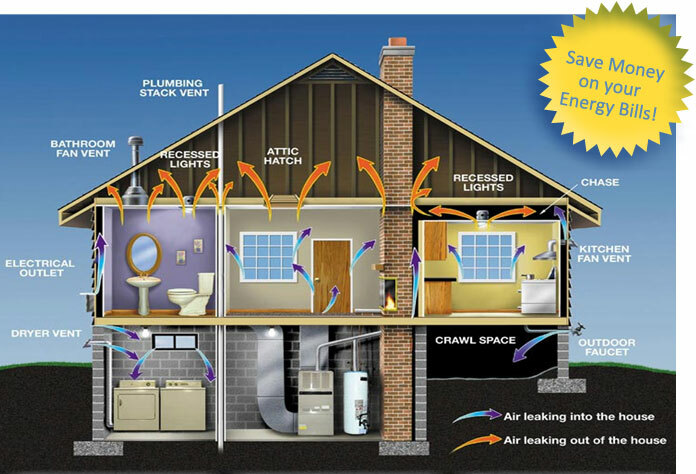 If you have air sealing or insulation problems throughout your home, your heating and cooling system has to work twice as hard, resulting in higher energy bills, a less comfortable home and potential indoor air quality issues. Just as you would want an expert to service the systems of your car, you want an expert to analyze the systems of your hoe to help it function at its best. Clear Choice Energy Solutions are your experts. Here at Clear Choice Energy Solutions, our technicians have been trained to BPI Building Analysts and Envelope Professional Levels. BPI is a national standards development organization for residential energy efficiency and weatherization retrofit work. As an independent, non-profit organization, they bring together leading building science experts from across North America to develop our standards using a consensus based methodology. Clear Choice Energy Solutions Comprehensive Home Performance Assessments utilize high-tech equipment and techniques to scientifically pinpoint the areas of weakness in your home’s energy systems. Using this approach, we are able to fix the problem at the source, not just treat the symptoms. We use tools like the Blower Door to test for hidden areas where air is leaking in to your home. Treating issues like this leads to a home that is more healthy, comfortable and safe to live in, not to mention easier on your homes ever rising energy bills. We use building science along with cutting edge equipment to help us give you real solutions to the issues you are facing. Using equipment like the Thermal Imaging Camera helps us quickly look at issues such as under insulated walls, gaps in insulation, moisture problems and other issues. This allows us to find and pinpoint Opportunities for home performance improvements. This means we can save you time and money by not having to guess where the problem is and how to solve it. Our 10-point inspections cover every aspect of your homes performance, helping to make it the most comfortable and energy efficient it can be. We put all the information we gather about your home to good use for you. With a prioritized list of recommendations, including what projects will give you the best return on your money, you’ll know exactly where to begin. Plus, if you need help getting that project done, you’ll find Clear Choice Energy Solutions is the best choice in helping you with your project needs. To start improving the comfort, health, safety and energy efficiency of your home, contact Clear Choice Energy Solutions today, for your Comprehensive Home Performance Assessment.